Whether or not you’re new to making smoothies sometimes you get into a rut and you want to add new ingredients but don’t want to buy a whole bevy of them or some of your favorites aren’t in season. This is a great time to tap into an easy-to-find option: baby food. You can buy it in jars, but with advent of the pouch adding a pure fruit or a mixed fruit & veggie puree to your drink is super simple (some even have chia!). Most brands now offer some of their foods in a pouch (even Target has several options) and there are also plenty of organic choices. 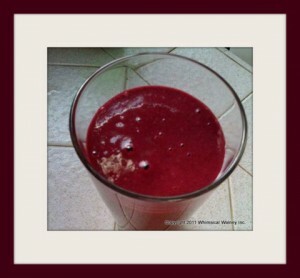 The color of this smoothie depends on how much greens you add it typically is more beet colored than green. Previous post: Do You Think Yoga Can “Wreck Your Body”?